What was your outdoor project this summer? I may have to back up a little, before I declare one of our outdoor projects this year (its been ongoing for at least 18 months) so, I should say its a work in progress. There was a time that we couldn’t see the wood for the trees, that should give you a clue. No it’s not a tree house. 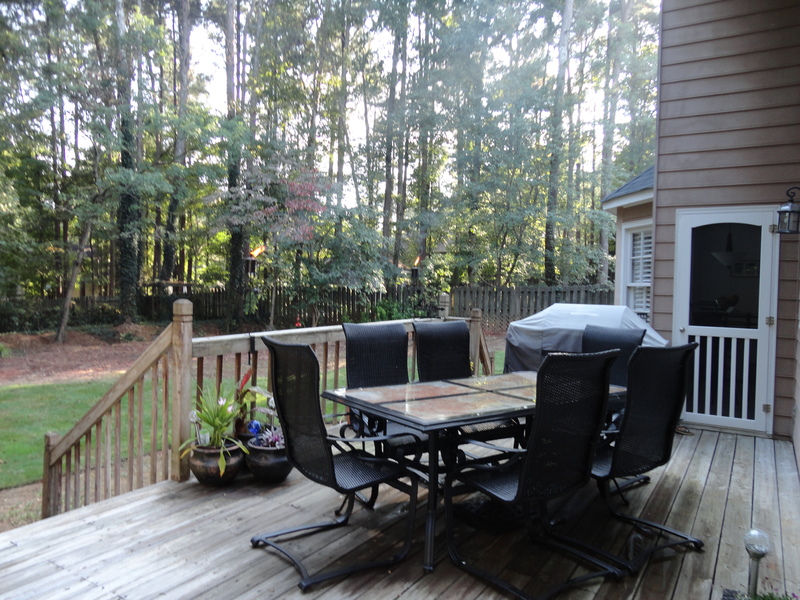 This was a picture of the deck before we moved into our home. initially covered in 3 inches of pine straw and leaves. As we are from the UK, time outdoors is precious, therefore we were eager to make the most of our deck in the back garden. 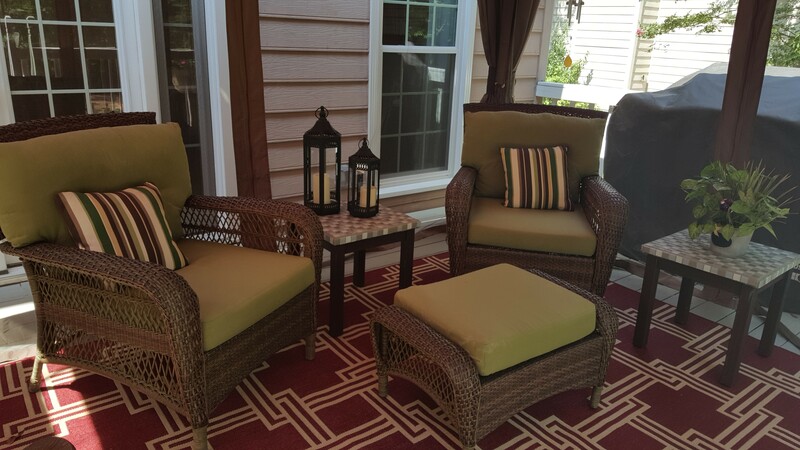 We used existing outdoor furniture from our previous home. Table and Chairs from Sears, Wicker Chairs – Martha Stewart – Home Depot. Rocking Chair (not shown in the picture) bought from a visit to Cracker Barrel. The Deck is desperately in need of an upgrade. We decided to invest in having the front and back gardens looked at by a landscaper from Pikes Nurseries, he advised and designed the front and back gardens for us including the kind of shrubs and plants that we should be planting. A subject for another blog post. 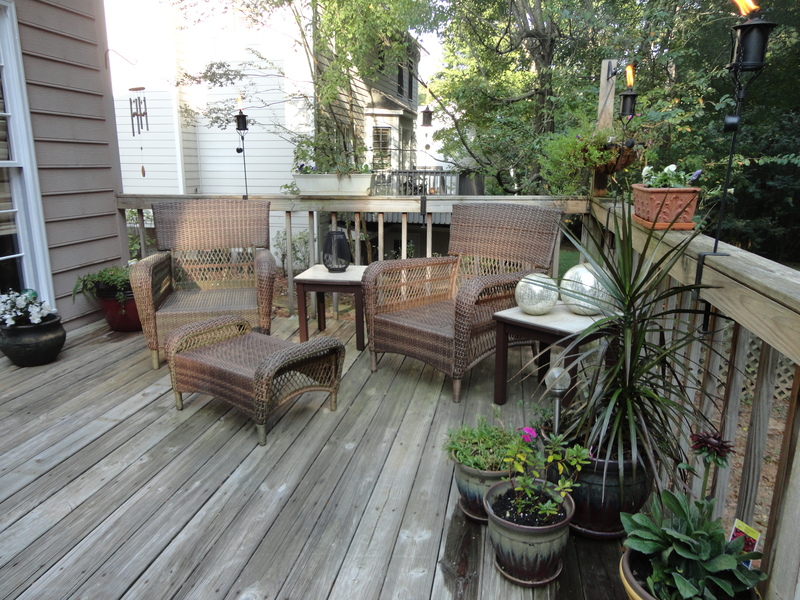 My husband and I really wanted to get more use out of our deck area. However, mosquitos were preventing us from spending time outdoors, particularly in the evening. We love dining outdoors and relaxing. Like most couples, we are on a budget. So we had to make the best of what we had. The gazebo we bought at the end of the summer season so we saved over $100, picking the gazebo up from our local Home Depot store saved a delivery charge. It took a while to put together, (an understatement), only a little blood, sweat and the odd cuss word were involved. Next an Outdoor Rug to cover the damaged deck boards. I seriously didn’t realize how expensive Outdoor Rugs were. 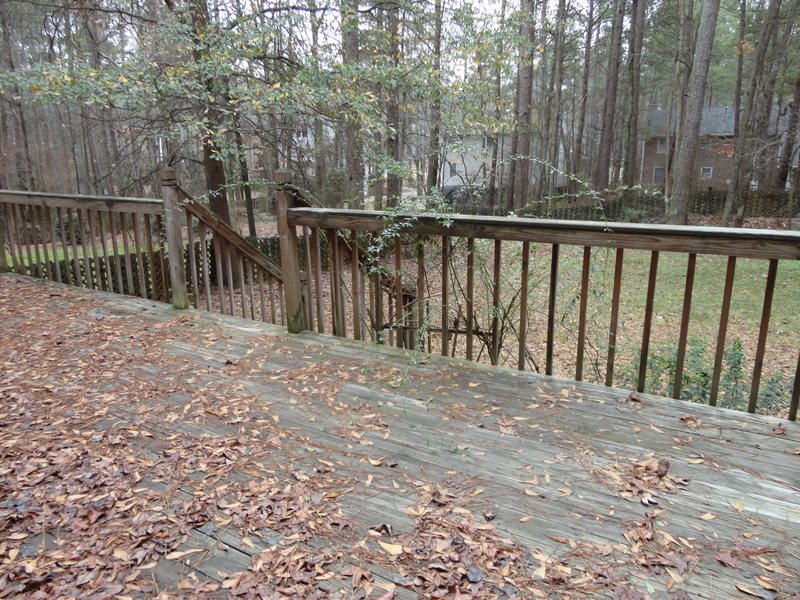 Plus, this didn’t address the deck rails, they still looked drab. Spot the mistake, we should have painted the boards and rails, before erecting the gazebo. I was trying to avoid having to paint the deck as I have undertaken a similar project before, so I knew it would take time and patience. What a difference paint and bright décor can make! We settled for an eclectic mix of colour, bright and cheerful, no more drab. Now the sidings require painting!, guess what? I think the gazebo may have to come down to do that. Not this year! Deck cleaner solution, because it was in such a mess we used probably about 5 litres – Home Depot. Deckover paint by Behr, A 5 gallon bucket, but there is enough left to possibly recoat. I used a roller and hand paint brush, its really thick to apply and our deck needed two coats. For the rails we used Behr Weatherproofing All-In-One Woodstain and cleaner in White, once again 3 coats were needed, in some places 4 coats. It was worth every ache and pain. 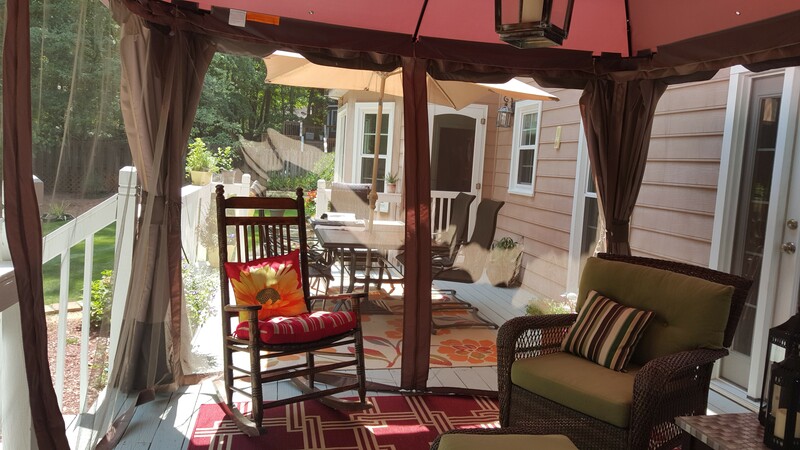 We felt so proud of our newly redecorated deck that we held our first cook-out following our renovation. 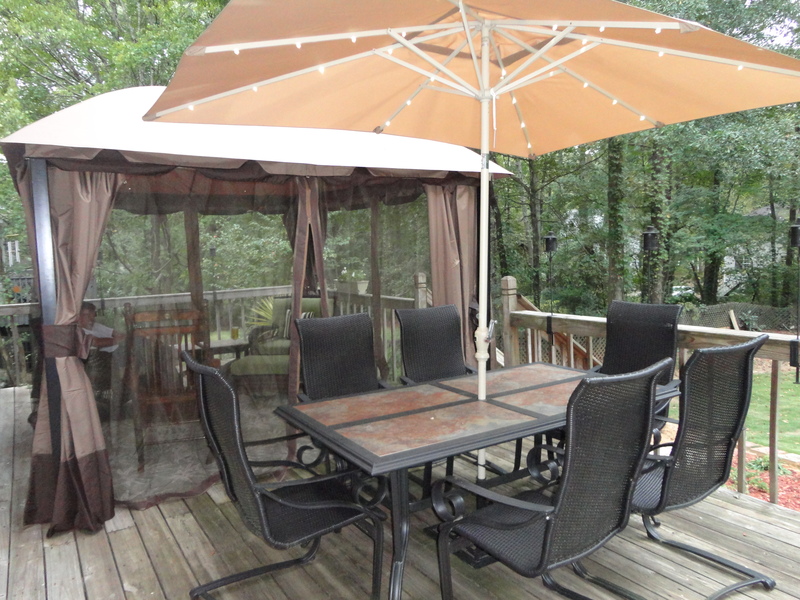 Now we can sit in our gazebo without worry. See next post about further accessories and how to cover end tables on a budget, plus planting, growing and adding colour to the garden. What was your outdoor project this summer. 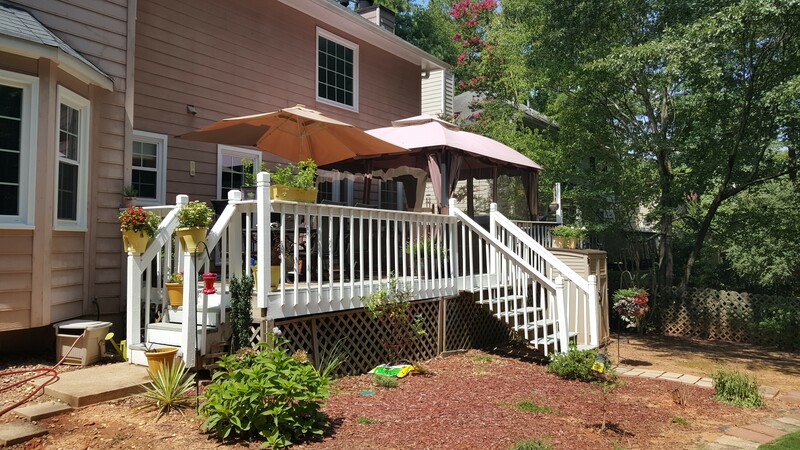 This entry was posted in Renovations & D.I.Y and tagged Behr paint, Cracker Barrel, D.I.Y, deck renovation, Garden deck, Gazebo, Martha Stewart, Outdoor Area Rugs, Outdoor Project, Sears, Walmart. Bookmark the permalink. I love it Geri! Your outdoor living space is so cozy! You have just inspired me to make my own outdoor space next spring!